AP--ATLANTA (Aug. 4) - Skip Caray, a voice of the Atlanta Braves for 33 years and part of a family line of baseball broadcasters that included ASA Hall of Famer Harry Caray, died in his sleep at home on Sunday, the team said. He was 68. The cause of death was not immediately known, but various health problems had limited Caray to calling only Braves home games this season. "We've all lost a very good friend," Braves manager Bobby Cox said. "For me, he was a good buddy - at the park and away from the park. We always had a lot of great laughs. He will be very sorely missed." Caray, a longtime ASA member, was drawn into broadcasting by his father, Harry, the longtime voice of the Chicago Cubs and a member of the National Baseball Hall of Fame. The family line has continued with two of Skip Caray's sons. Chip Caray is part of the Braves broadcast team and Josh Caray is working on the radio for the Class A Rome Braves. While his father was known for his declarations of "Holy Cow," Skip Caray was able to declare "Braves Win! Braves Win!" with regularity as the team won 14 consecutive division titles beginning in 1991 and the 1995 World Series. "Our baseball community has lost a legend today," Braves president John Schuerholz said. "The Braves family and Braves fans everywhere will sadly miss him. Our thoughts are with his wife Paula and his children." Caray and Pete Van Wieren have been broadcasting Braves games since 1976. Caray's sarcastic wit made him a popular lead voice of the broadcast team, and his fame grew nationally as TBS carried Braves games to a national audience for 30 years. After decades of calling the Braves America's Team, TBS this year began a seven-year contract of national weekly telecasts, leaving the Braves to the regional Peachtree TV network - and leaving Caray to radio work on home games. Health problems also cut into Caray's workload. Caray said this year he was battling diabetes, congestive heart failure, an irregular heartbeat and reduced kidney and liver functions. 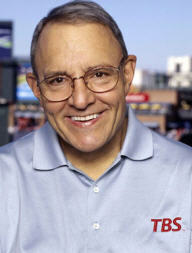 "I almost died in October (2007)," Caray told The Atlanta Journal-Constitution at the Braves' 2008 home opener. Still, Caray's death came as a shock, even to those who worked closely with him. "He's had some medical issues but you're never ready for something like this," longtime TBS producer Glenn Diamond said Sunday night. "We're all very shocked by the timing. It's a very sad day for family and for Braves fans. I think the Braves fans feel they're part of Skip's family." Caray, a St. Louis native, started in local radio and later joined his father at the University of Missouri calling football. He joined the St. Louis Hawks NBA broadcasting team and followed them to Atlanta in 1968. He was added to the Braves broadcast team in 1976. Caray and Van Wieren were inducted into the Braves Hall of Fame in 2005. Caray was named Georgia sportscaster of the year six times. "He had a huge impact on a lot of people's lives and he had a huge impact on my life," Diamond said. "During the season we spent more time together than we did with our families and our lives." Caray is survived by his wife and four children. The Braves said funeral arrangements will be announced later.